Had my second workout today! It’s amazing how much better I felt today than I did Saturday. Not too much to say tonight, and it’s a little late (because I had to come home between work and the gym), so I’m just going to give a brief recap of the day. I ate all of my normal pre-planned meals today. I also had a couple snacks: 2 TBSP of hummus with 75 grams (yes, I weigh my food and so should you!) of carrots and a clementine for a total of 140 calories, and 1/3 of an ALT Larabar and one whole opal apple (these are my new favorite, they almost have a honey taste to them) for a total of 170 calories. Since I had a late dinner I’m thinking I’ll just have a cup of hot chocolate (made with almond milk) and 10 cherries for dessert for a total of 150 calories (I only use half of the hot chocolate packet). On the treadmill today I completed another treadmill workout just to keep things interesting. 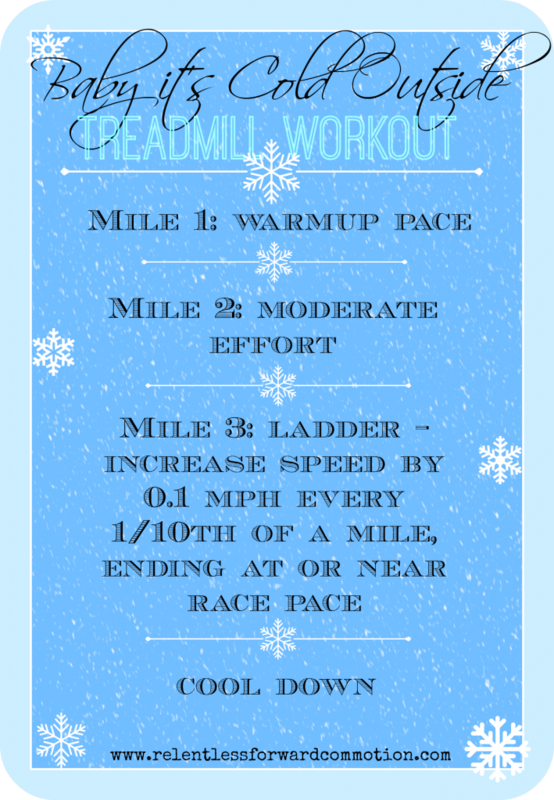 As I scrolled through my Fitness Pinterest board I decided that the “Baby it’s Cold Outside” workout seemed most appropriate seeing as the temperature is still hovering around 0. Like before, I made a few adjustments. My warm up pace was 5.7 mph for 1 mile, then a moderate pace of 6.0 for 1 mile, then I added .1 to my mph for every .1 miles for mile 3, but I also dropped it down .1 mph for every .1 mile for mile 4. Then I ran a half mile at 6.0 amnd another half mile at 5.7 for a grand total of 5 miles, plus a few minutes of walking warm up and cool down. Off the treadmill, I did 98 crunches (the kind where you cross your knees and bring them into your chest while also raising your shoulders off the mat. those kind. ), 49 arm leg reaches (because I really need to work on my core and back strength) and a 49 second plank. I’m a big nerd so I’m doing things in increments of 49 in honor of my 49 days of weight loss. How are your fitness goals coming along? Are your workouts being affected by this brutal cold?